On the importance of identifying mission spoilers. Vacation... Mission... What’s the difference when a single individual can bring ruin to an otherwise well-planned task? Otherworldly deputations nor tropical escapes can guarantee freedom from Gilliganesque maleisons that creep into Planned Time. 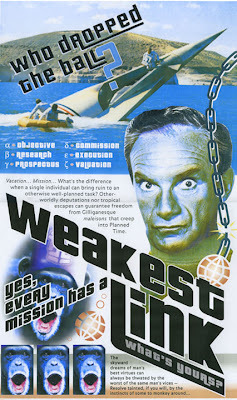 Yes, every mission has a weakest link: the Aeolus 14 Umbra factor. Whether the mission is aboard the S.S. Minnow or the ANSA Icarus, the agent must be identified. The author has been tagged by Blandly Urbane of DeMediacratic Nation. Tagging in the Blogosphere means, that if you’ve been picked, you have to pick five to ten others to follow suit. Here are some questions and answers. The questions can be changed when you “tag” some other blogger. If you’re tagged, answer the questions on your blog. Band: Zeppelin. They’re still cool, right? Ben Franklin. He was a Buckaroo Bonzai-type character from the early American political scene. You may have heard of him. 3) Favorite historical politician (International)? Aelius Hadrianus, another fine Renaissance man. Art, Graphic Design, Cultural Criticism, Psy-Ops: The Nexus of Image, Language and Meaning. Open to interpretation; opinions welcome. 5) Other than where you live now, what city do you like? Kyoto is nice, München, too; Olde Smithville is a charm, as is Delta, Unincorporated. But the ideal is Heritageville USA, an enchanting hamlet where even the children are smarter than the vapid adults of Lake Wobegon. None impressive enough to mention, except perhaps Xarg VI, Grand Praetor of Xarnaq IV. Oh wait, you meant on Earth, right? 7) Are you a Wilsonian Idealist or Nixonian Realist in foreign policy? The Swimmer, with Burt Lancaster; Charly, with Cliff Robertson. 9) What is your favorite restaurant? Zaberer’s, from ancient memory: Eye candy, ear candy, and, er, mouth candy? Guess that would be the caviar. Or perhaps Fisher’s, back before The Cheapening. 10) Choose a music video on YouTube. Why that one? Here. A video communique, intended to confuse.